My preferred "style" is definitely minimalist-leaning without being completely spartan (Proper capitalization and punctuation? On a blog? Gadzooks! 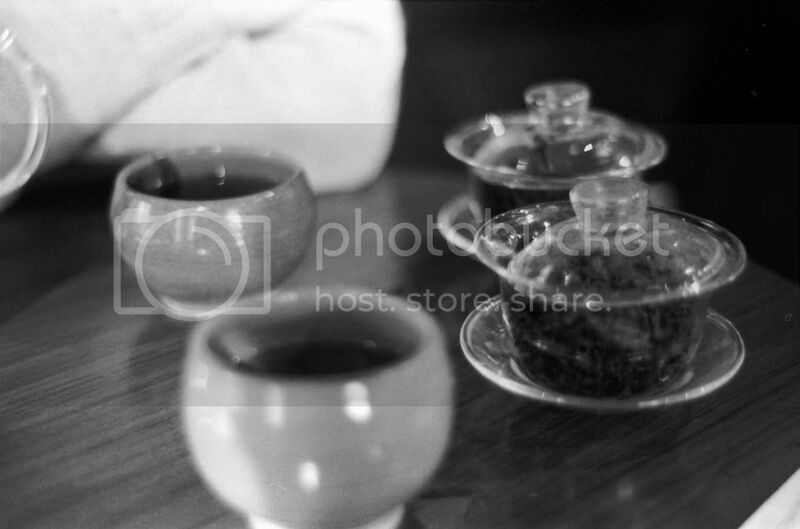 ), as you may have noticed through my teaware choices and the various templates Tea Nerd has sported in the past. Even putting aside aesthetics, there is something elegant and satisfying about having a clean, simple, capable set of tools. 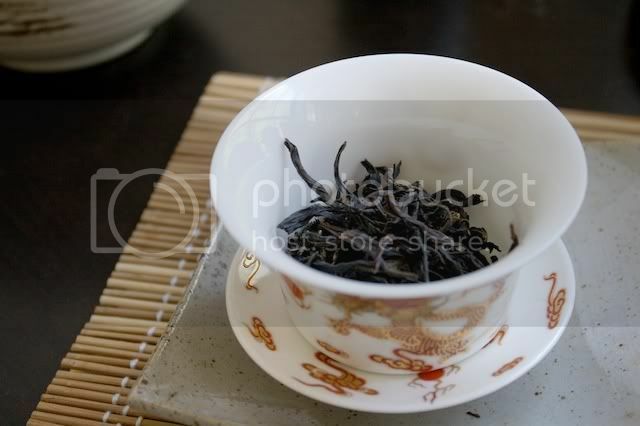 I brewed up the last of a sample of 90's Golden Pearls Dancong. A bit stale, but still tasty. I have to say, I'm not sure tea would be quite as good if I knew it would never go stale. Hope you weren't expecting a lot of text! Bwahaha, I'll bet I had you going for a minute there with this title. It's actually exactly the opposite of what you are thinking. This is mostly a "look guys, this blog really isn't dead" post, but here's a fun fact: over the past few months, despite drinking almost zero tea, I have lost 20 pounds. Now, I could use this anecdote to launch into a satire about how dumb the customers of weight-loss tea companies are, but this has already been done to death so I'll spare you. Anyway, look guys, this blog really isn't dead. ["Comatose" works, though.] Like I said, I just haven't been drinking much tea at all, for various reasons. I'll get back into it eventually, but I don't want to stuff this blog full of boring filler reviews about teas I'm really just not that interested in (no offense to the vendors whose teas I have stockpiled) right now. This was a free sample I got with my order. I almost ordered a small amount but decided against it; apparently they can read minds (is there anything The Tea Gallery people don't do well?). This is a very solid tea, definitely worth picking up if you like roasted teas. It is roasted just heavily enough without being harsh, at least to my palate. I brewed it pretty strongly, using all the leaf shown in the photo. I still haven't quite figured out this method, and mouthfeel tends to suffer as a result, so I can't really comment on that. It does produce lots and lots of tasty infusions, though. The aroma is nice and toasty, with some deep rich fruitiness and a bit of cocoa. 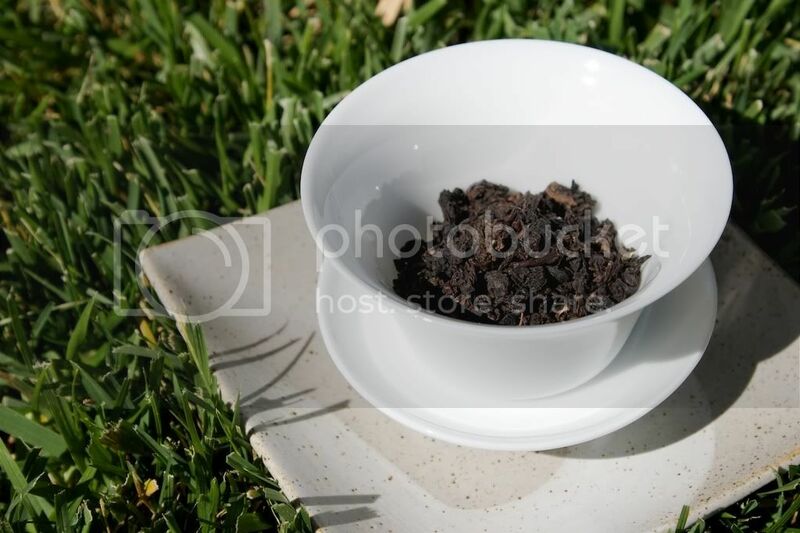 The flavor is everything you would want from a roasted Tie Guan Yin and more: deep cocoa and fruit for the bass notes (I hesitate to use the word "bass" to describe tea flavor in print, for obvious reasons) with sweet high notes. Every now and then I picked up some cinnamon (more obvious in the lid aroma), though not as strongly as in some yancha. Thumbs up! 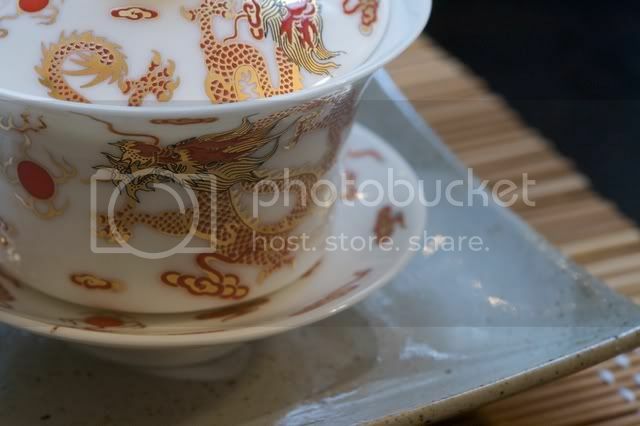 A big thumbs up also goes to my new gaiwan from The Tea Gallery, shown above. The lid fits perfectly, the porcelain is thin without feeling fragile (the cup is slightly translucent), and there are no bumps or blemishes. I don't claim to be an expert in gaiwans, but this one really looks and feels great. Newbie's Guide to Teaware: Getting Started and T.O.C. Matcha Madness (Part II, Part III). If you have no experience brewing tea, or have only dunked teabags in coffee cups, you will likely find The Spartan and The Lone Ranger guides the most useful. If you have some experience brewing loose leaf tea, you probably already have a setup similar to The Spartan. You may find The Lone Ranger refreshing and convenient, or you might want to step up your game with The Orient Express. 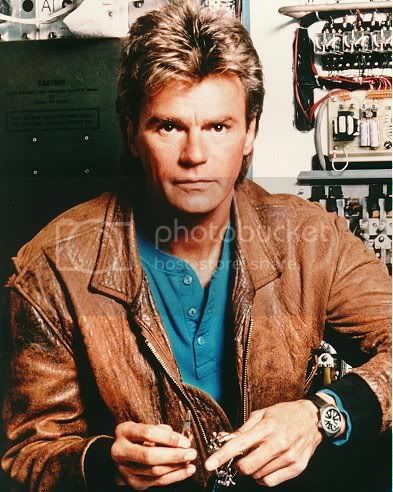 If you are absolutely broke but have some basic kitchen equipment, or like doing things the wrong way, read The MacGyver first. 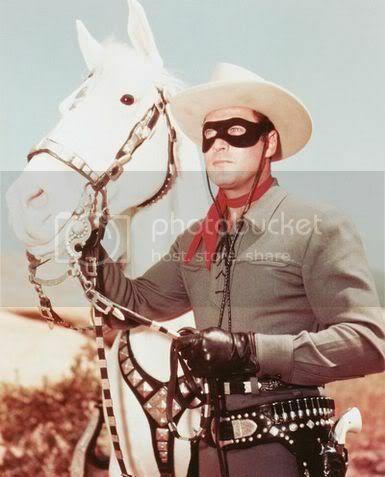 Then, read The Lone Ranger. Want to brew tea in an office environment? The Lone Ranger is low-profile and low fuss, and The Orient Express can be equally convenient if you go with a very basic setup. The Spartan may work, but it doesn't really do anything the Lone Ranger can't, in less space. 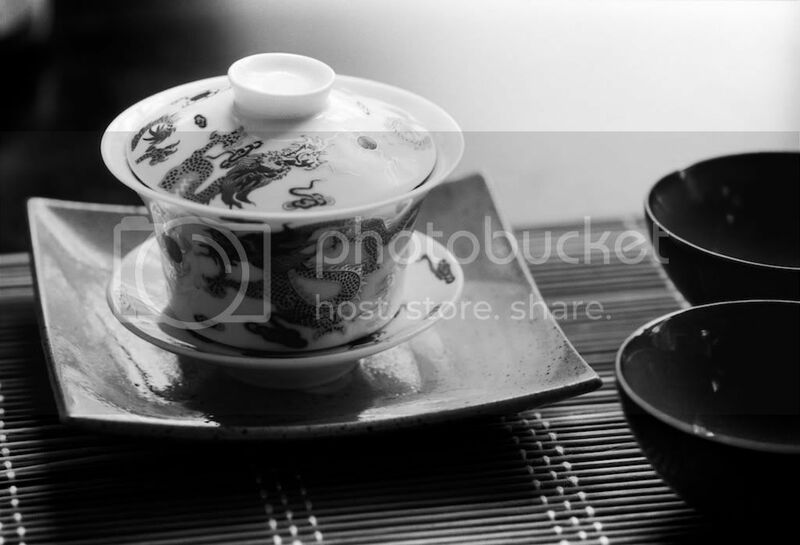 Continued from Newbie's Guide to Teaware: The Orient Express (Part II: Teapots and Gaiwans). Yay! The hard concepts are over; you're on the home stretch now. There is actually more than meets the eye when it comes to cups for Eastern brewing, but we'll avoid the more esoteric stuff for now. There are a couple ways to go about this. 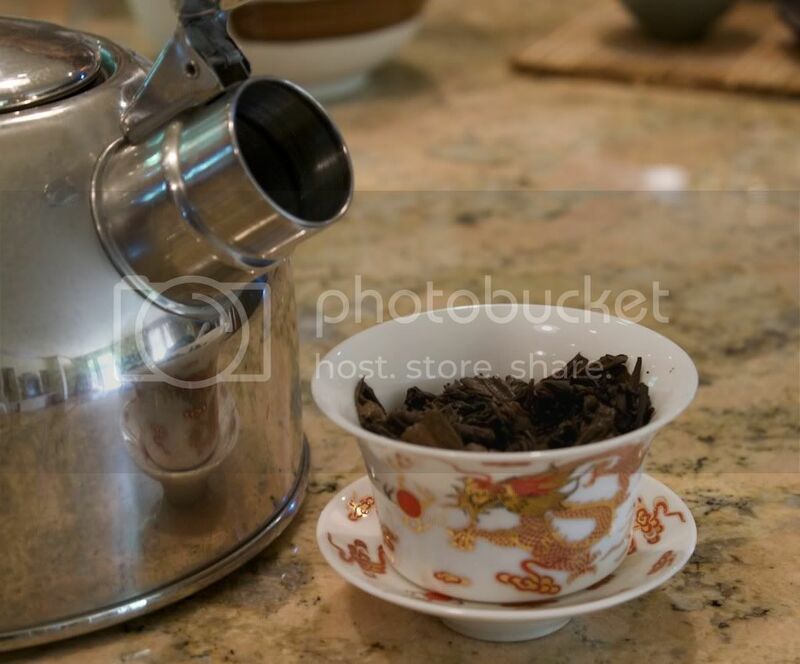 One way is to buy a cup roughly equal in volume to your teapots/gaiwans, or two cups around half that volume each. This is very simple and easy, and I prefer the minimalist aesthetics. The other strategy is to buy a few or more teeny (1 oz) cups and a faircup, which I'll get to in a moment. Some people like those little cups, but I don't and you probably won't either if you are used to 6-8oz cups. The two extremes are the tulip shape and the flat-ish bowl shape. For our purposes, it's mostly a matter of aesthetics. 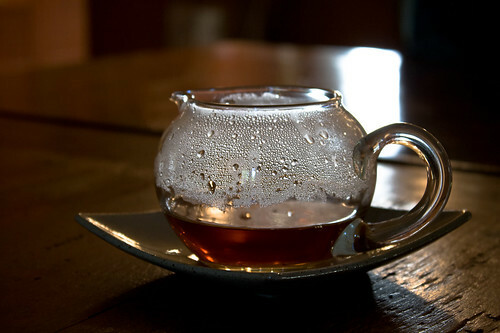 Flatter cups cool your tea faster (more liquid surface area is exposed), but it is much easier to spill from them. The most common materials you are likely to see are porcelain, stoneware (glazed or not), glass, and celadon (a very popular glaze, somewhere between green and blue in color). I would probably avoid unglazed stoneware, but other than that, go for aesthetics. 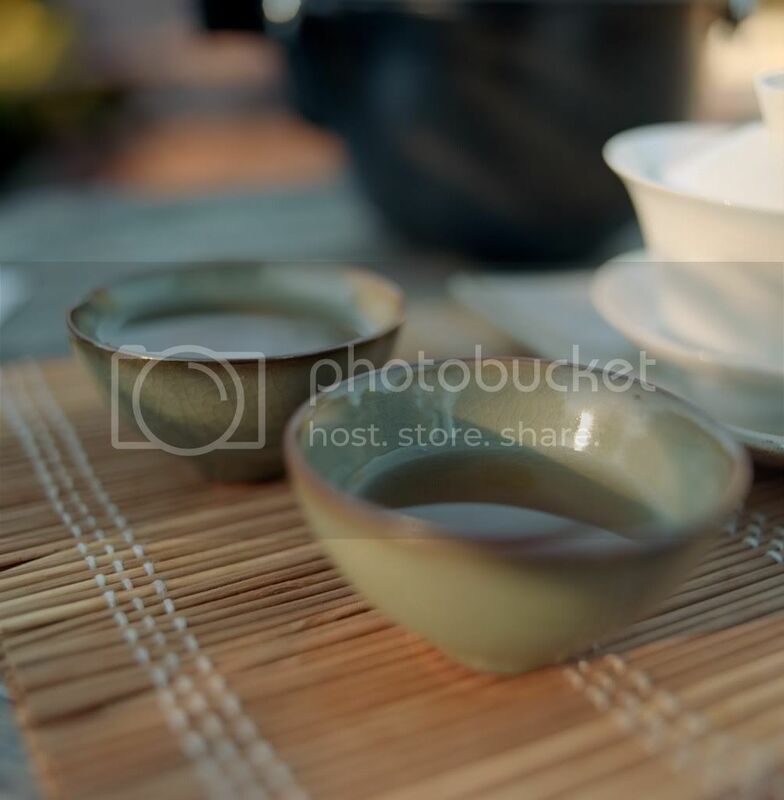 While a white porcelain or white-glazed stoneware cup will allow a tea's true color to show, celadon tends to make the tea's color much more attractive, particularly with green teas and greener oolongs. Glass doesn't display color very well, in my experience, but go for it if you like glass. A.K.A. Wenxiangbei (See Hobbes's excellent wenxiangbei article). Try them out if you like, you will probably get at least some enjoyment out of them. They provide extra aroma data when tasting a tea, which can be nice. I grew tired of using them, but many do not. Left: R.I.P. with your fallen brethren. Right: My new baby. Let's hope it survives more than a few months. You're probably wondering about the name. These are also called fairness cups, sharing pitchers, servers, or a few other choice words* (by me anyway). They are "fair" because if you decant your tea into a faircup, the tea will mix evenly, so every guest receives tea of the same strength. If you try to decant from a teapot or gaiwan into several cups, you have to make several passes to balance the strength of each cup, and chances are it still won't be very even. You really don't need a faircup if you are decanting into one or two cups, though, so this is an optional item for the budget-conscious. *Why do I curse at my faircups? Don't get me wrong, they are great tools. For whatever reason, they like to break for me. I have only slightly chipped one gaiwan and had just two Yixings and one cup break in transit, but I have destroyed at least four or five faircups. Can't explain it. Anyway. There's not a whole lot to say about them, just pick one that looks pretty. Most of the time they are either heat-resistant glass or porcelain. I think porcelain clashes with some tea setups, so I prefer glass, but that's just me. Whatever. 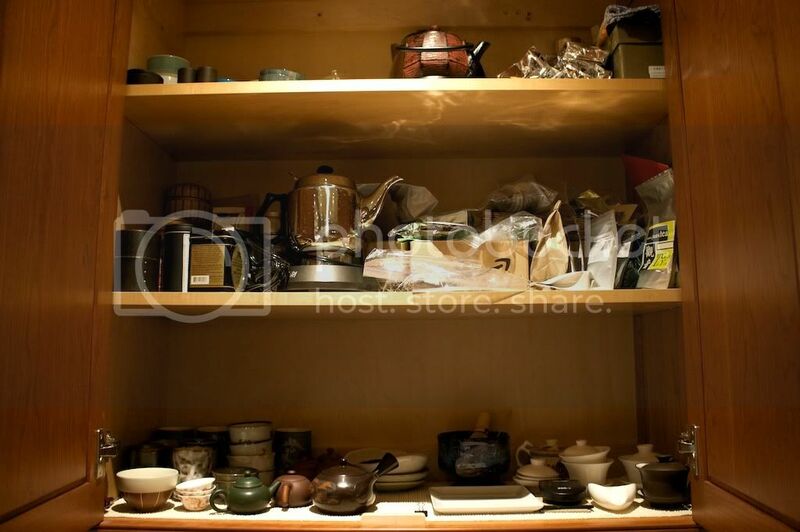 Most tea and teaware vendors carry them and they are generally the same level of quality, unless you find an artisan piece. 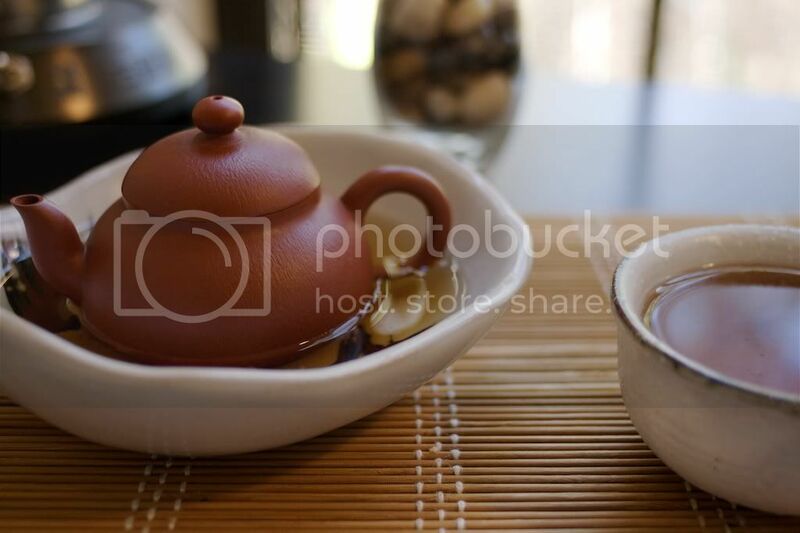 Try Yunnan Sourcing, Dragon Tea House, and Imperial Tea Court for starters. Ah yes, the tea tray. I don't use one very much anymore; I prefer a simple mat and waste bowl setup for aesthetic reasons, but they are undeniably useful. Still, you can get by without one quite easily, so I consider it optional. Aside from size, shape, materials, and color (these are mostly a matter of personal preference), there are three main styles of tea tray. One is the basic two-piece box type, which is essentially a large waste trough with a slotted surface placed above it. These are simple, cheap, and usually the most compact (making them ideal for the space-challenged), but there are two problems. First, it may or may not be watertight. Metal trays are probably fine, but my bamboo tray leaks A LOT. Second, if you fill this up too much, it is quite difficult to carry to a sink without spilling. Another, the kind with a removable plastic tray (shown above, right underneath the blowtorch), is very similar to the two-piece box tray. The plastic tray is less likely to leak and easier to clean than wood. It also allows for (potentially) much larger and more luxurious tea tray designs, as the plastic tray only has to sit beneath the slotted portion. However, these plastic trays are even harder to carry when full, as they can twist more than wood. The third type is a solid piece of wood (whether flat for use on a table, or an enormous block of wood which serves as its own table) with grooves leading to a drain. One generally connects the drain via a plastic tube to a bucket, so cleanup is easier and less frequent. The downsides? You can't dump leaves in the drain, so you need to either use the collecting bucket or a separate waste bowl. Also, you can't dump liquids as quickly due to the bottleneck in the drain. 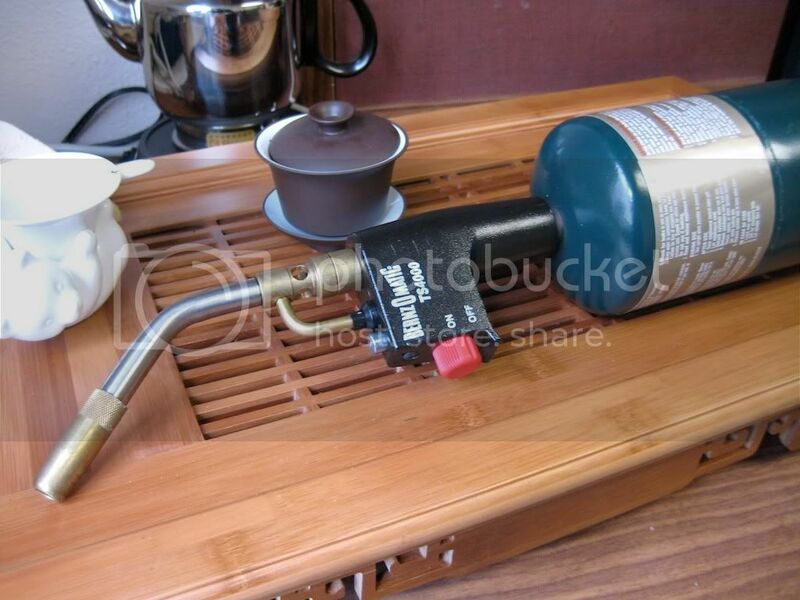 "A Look at 32 Tea Tables" is a great guide to the various options out there on the 'net. It was written a while ago so some links may be outdated, but it is still the best guide that I know of. A container for discarded rinses, leaves, etc. This item's function is dependent on its design which is, simply put, a concave continuous solid. The structure utilizes the downward force of gravity on tea waste and its partially opposed force from an inwardly-sloped interior surface to create a force vector pointing medially toward the inferior-most point of the interior surface. It is more effective if made from or covered by a non-moisture-absorbent material. That's it for this guide (finally)! Sorry about the recycled photos, some of them are baaaaddddd. As I said in the beginning, there are far more items traditionally used in Eastern brewing methods than those I have listed here— the various "Cha Dao" tools (an odd name, really), filters (possibly helpful for puerh, otherwise unnecessary in my opinion), water baths for cleaning/warming cups, etc. For practical/newbie brewing, they aren't necessary or even particularly helpful. This will likely be the last article of the series. Somewhere down the road I may write another, but it probably won't be any time soon. However I would enjoy writing shorter articles on specific teaware questions submitted by readers, so ask away! 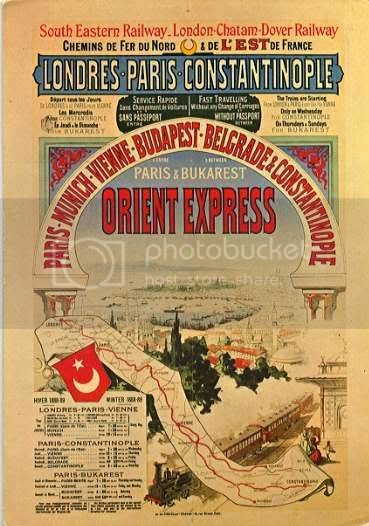 Continued from Newbie's Guide to Teaware: The Orient Express (Part I: Kettles). This is dangerous territory. It seems that there are about as many opinions on the gaiwan and teapot issue as there are tea drinkers (and that's not even counting the arguments over the various types of Yixing clay)! I'll try to explain the basics of both, but it's up to you to decide which you prefer. I also can’t promise that I’ll be completely neutral in my recommendations, so you should research elsewhere too. 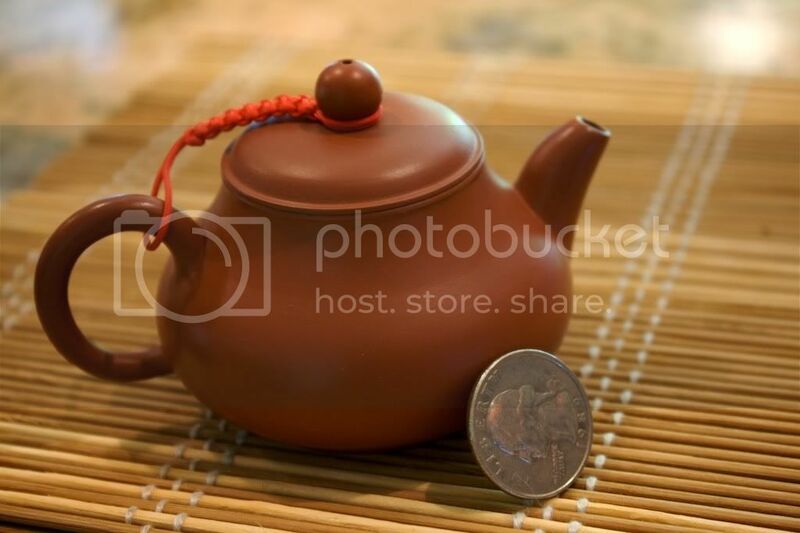 If you are used to brewing tea in big honkin' two-cup or larger teapots, gaiwans and Yixing teapots are going to look shockingly small. The online pictures don't usually convey how teeny they are, so be prepared! If you are brewing tea for one or two people, 5 oz (~150 mL) is considered large (I promise you, it will feel that way after a few long sessions with it). I prefer something in the 3-4oz (90-120 mL) range, and some use vessels even smaller than 2 oz (60 mL). You may be wondering, "Why so small? Do you just drink less tea this way?" The main difference is that typical Western brewing produces a large quantity of tea a few times, while Eastern methods produce a small quantity of tea many times. This is accomplished by using a lot of leaf per volume of water, compared to big-pot brewing, with shorter infusion times. If that doesn't make sense, mull it over a bit, you'll get it eventually! What's all the fuss about Yixing? 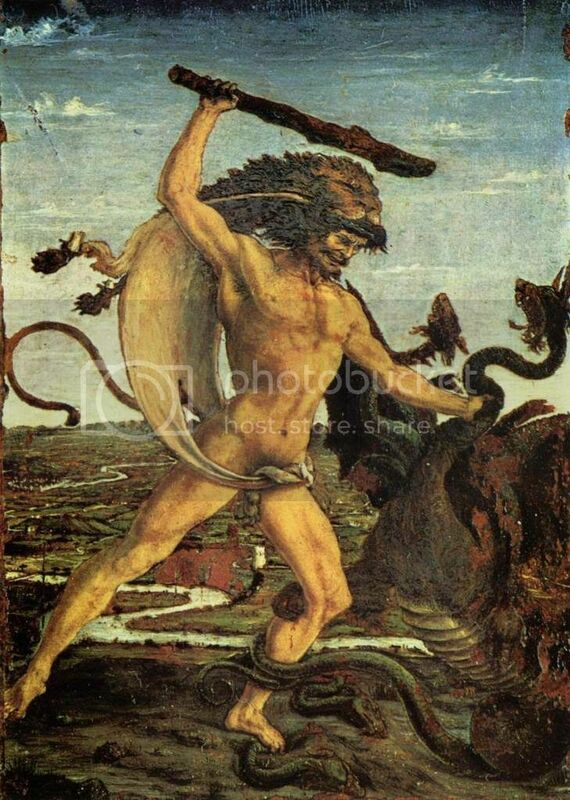 If you believe what some have to say, this wünderclay has the power to call on ancient spirits, quell demons, restore the balance of one's four humors (that's right, I made a humorism reference), and grant godlike wisdom. However, many argue that this magical type of Yixing is extraordinarily rare, that 99.9% of what is on the market is dangerously laced with other clays and shoe polish, and that anyone who purchases teapots without the combined aid of the I Ching and a blind hermit is a buffoon. One of the main qualities Yixing is said to possess is a superior ability to absorb tea flavors. This "seasons" the pot and improves the flavor of the tea it brews by rounding out imperfections. 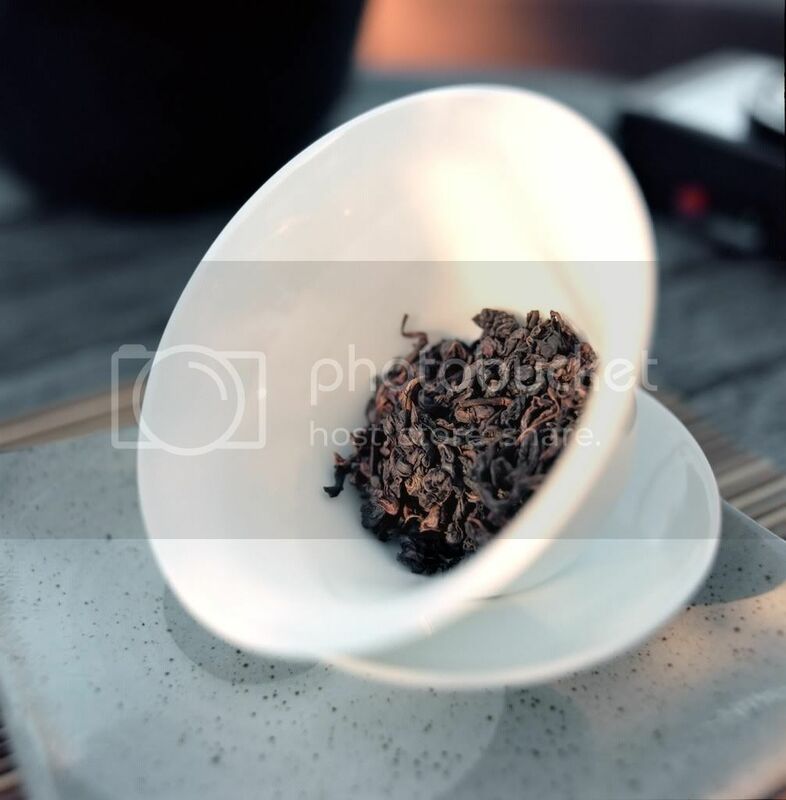 It seems to be commonly accepted that some residual tea flavor remains, but there are those who are skeptical whether Yixing is significantly, if at all, better than other clays. Still, a well-seasoned Yixing (a long process!) is supposed to be quite a thing to behold. 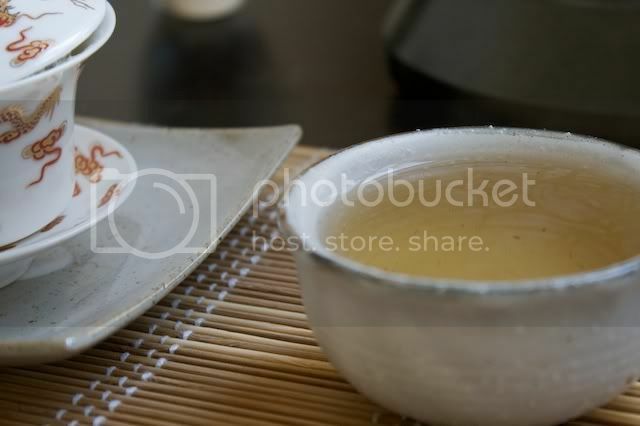 Related to the flavor absorption issue is the practice of dedicating a pot to a type of tea. 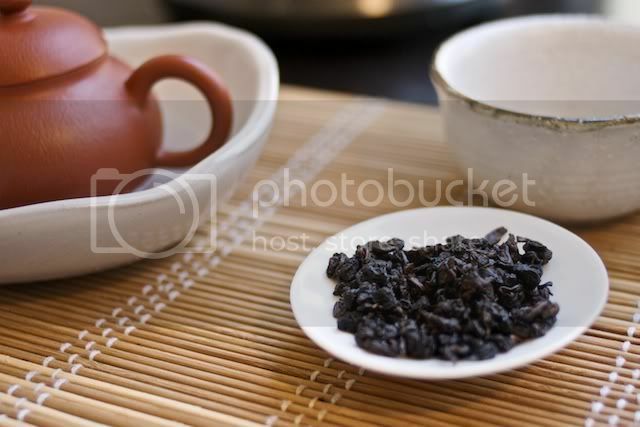 There is a large spectrum of beliefs here; there are those who will only brew Da Hong Pao in a certain teapot for fear of contamination with other yancha flavors, and there are those who will brew everything in one pot. It's up to you, really, but I advise a happy medium: avoid strongly contrasted flavors from colliding in the same pot. Yancha and roasted TGY? Not so bad. Baozhong and shu puerh? Oof. 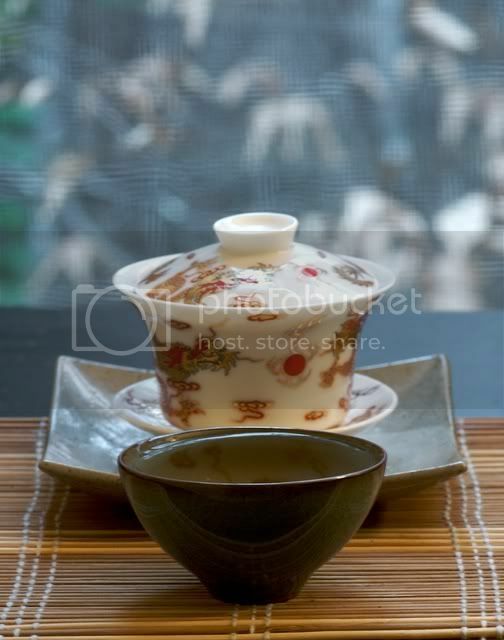 It is commonly said that you shouldn't brew green or white teas in a Yixing pot. I'm going to rebel a bit and say that I really haven't heard any good argument other than "it just doesn't work." 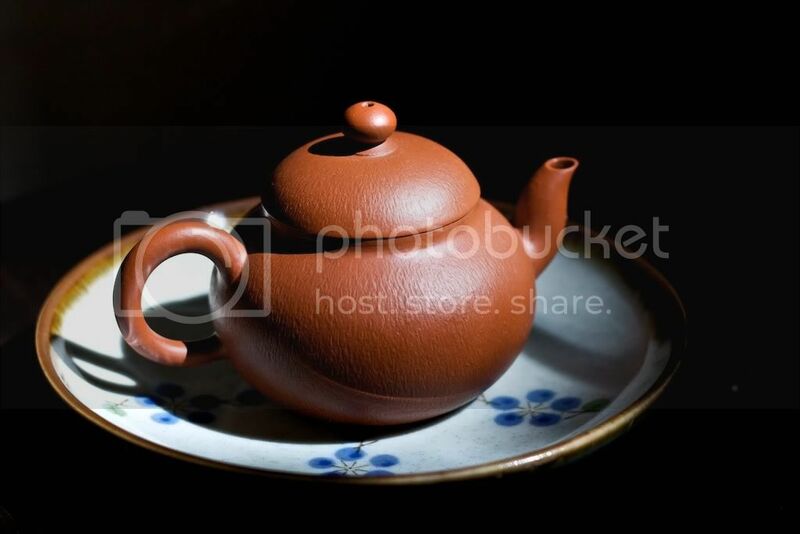 Some say "the clay doesn't work," but the next logical question to ask is, "Then why are so many unglazed clay teapots used exclusively for Japanese greens?" I have not yet heard a satisfying response to this question. It may be that Yixing is not the ideal brewing vessel for greens and whites, but as long as you watch your temperatures, they should come out just fine. I feel I should mention one last thing— pour speed. Cheap teapots usually have terrible pour speeds, sometimes 30 seconds or more. Obviously this becomes a problem when you are trying to do flash infusions! It is difficult to determine pour speed by photos alone, but larger spout openings are a good sign. I don't know if this generalization is valid, but all the cheap Xi Shi shape Yixing pots I've handled are slowwwww, so avoid those. Many, many books have been written about Yixing clay and pots, so there is no way I could explain everything. Notably absent here are discussions about types of clay and teapot shape; this information can be found elsewhere, but really isn’t important for first-timers. Brandon (the creator of wikiCHA) also offers a good newbie tip: avoid duan ni clay for your first Yixing. It tends to be much more rounding and subtracting than other clays. Thanks B! Compared to Yixing teapots, this is easy. 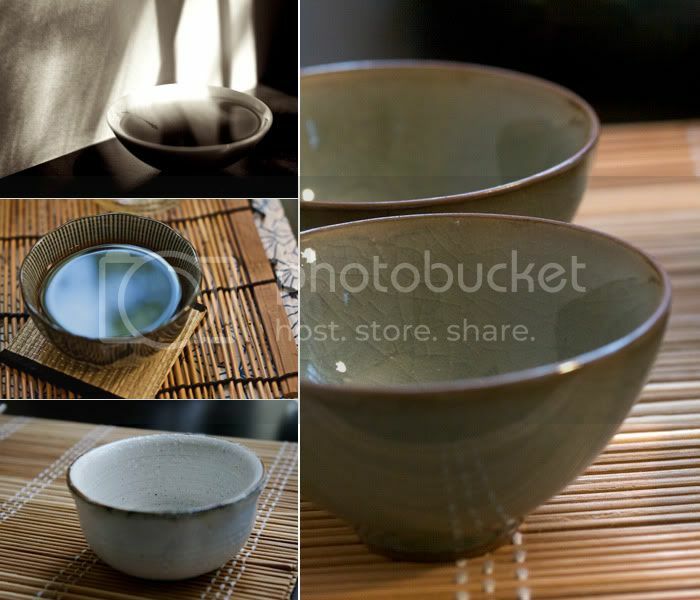 If you haven't seen one yet, a gaiwan is an elegantly simple two- or three-piece brewing tool. You can use it to brew tea, like a teapot, or you can drink directly from it, similar to how you would drink while glass brewing. These babies can brew anything, are often dirt cheap, and you don't have to worry about dedicating them to a certain type of tea. Gaiwans are usually made of porcelain, though glazed and unglazed clay (which you may want to dedicate) variants are not uncommon. They are a little tricky to use at first, but you should catch on pretty quickly, especially if you study this fantastic instructional video made my MarshalN. 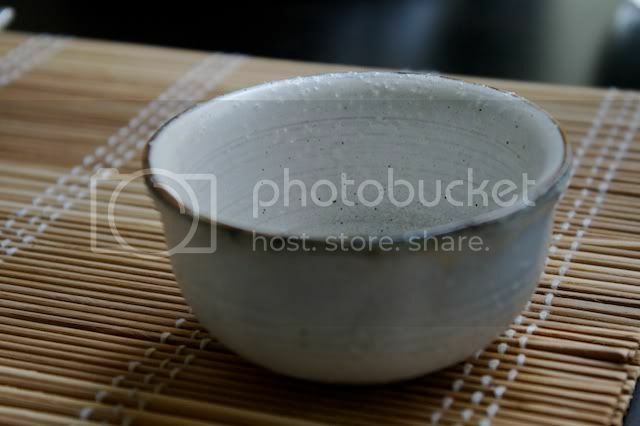 If you find that you really can't handle a gaiwan, you might look for a gaibei, a commonly used (if not entirely accurate) name for gaiwan with a handle and spout. Kind of a teapot/gaiwan crossbreed. While some prefer thicker stoneware gaiwans, I think porcelain is a better material for most purposes. Some complain that porcelain heats up too quickly, making porcelain gaiwans difficult to handle. Their response is that stoneware gaiwans are thicker and heavier, so they do not get unbearably hot as quickly. There are two problems with this argument. First, it is true that stoneware won't heat up as quickly. However, the other side of that coin is that stoneware will store more heat, so when it does heat up, there is no place to pick it up that will not burn you. Second, if you are preheating effectively (not just dumping hot water in and out, which has no effect on a big heat sink like a stoneware gaiwan), the stoneware automatically loses any advantage it may have had. There are times when a hollow cup-shaped block of magma is an appropriate gaiwan material though. 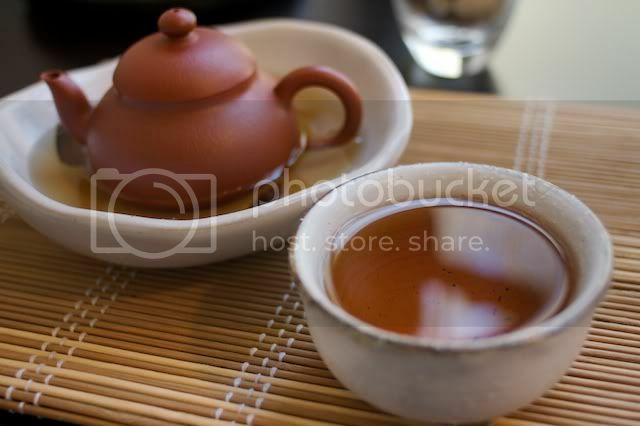 If you want more heat retention for a particular tea, stoneware is better than porcelain. I just hope you can pick that sucker up—if only it had a convenient handle. Oh wait, there is something just like that! A teapot! Here is the secret to not burning yourself with a porcelain gaiwan. Hold it by the very edge of the lip (where heat dissipates rapidly into the air) and don't pour hot water on your fingers. This does take a while to learn, but until then the easier way should work. Shorter infusions also help. If you are buying your first gaiwan, get something cheap. The odds are in favor of breakage. Once you feel more confident, step up and buy something nice— I promise you will enjoy it more. 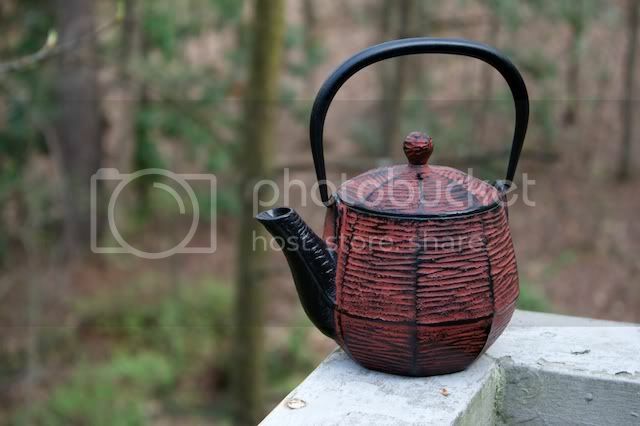 Yixing teapots are another matter. The cheapies are almost always terrible, and quality really does affect performance when it comes to teapots this tiny. Do yourself a solid and pony up for a $30+ teapot. Think of your blood pressure. Both! If budget is a concern, buy a gaiwan now and save for a Yixing later. Any cheap gaiwan in the 90-150 mL range. Look at these from Dragon Tea House or Yunnan Sourcing. Buy something cheap so you won't be too sad when you break it. Don't be concerned about these vendors being on eBay— they have very good reputations. Be aware that they are located in China, so shipping will take a long time if you don't pick the expedited option. I wouldn't spend too much on your first teapot, just in case. If you don't want to spare $40 + shipping for a teapot you won't curse at, it might be a good idea to stick with a cheap gaiwan for now. It's not over! There's more to come in the next post! Origin: Not sure. Shizuoka? Blend? 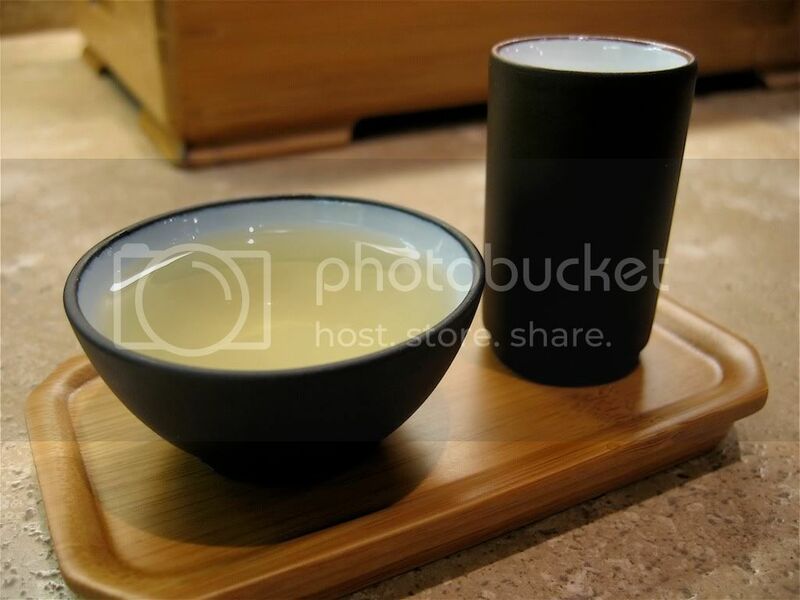 This shincha comes courtesy of Chip and Pentox of Teachat-- thanks guys! Hachiju hachiya means "88 nights" and, in this context, is a claim that this tea was picked on the very traditional 88th night from the beginning of spring. Mmm, history. I liked this tea quite a bit. For those who like precise parameters, I brewed 5.3g of leaf in 10oz of water (between 165-175F) for 60s, 30s, 60s, and 90s. 1st Infusion: A little creamy, clean, good solid foundation flavor. 2nd: Nice green color. Bright flavor, intense, "chewy". A little muddled, not clean like the first. Slightly grassy, slightly sweet. A bit marine. 3rd: Best flavor, still pretty green in color. Sweeter and less intense than the 2nd, also cleaner. 4th: Yellow-green color. Still pleasant and sweet, not a whole lot else though. Based on the leaves and the flavor, this is probably in-between chumushi and fukamushi. 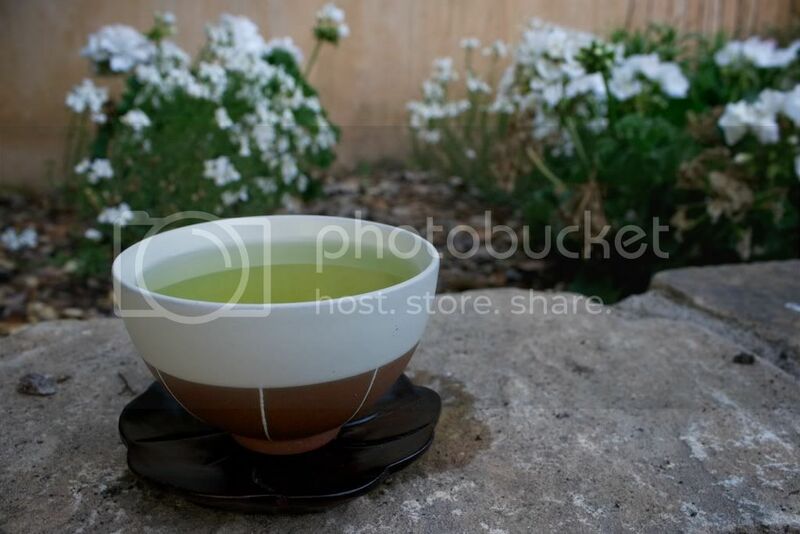 Between this tea and Zencha's Takumi, I think I prefer Takumi, but only by a slim margin. They are different beasts; this one seems sweeter and more candy-like than Takumi, while Takumi has a more satisfying "round" or balanced quality. 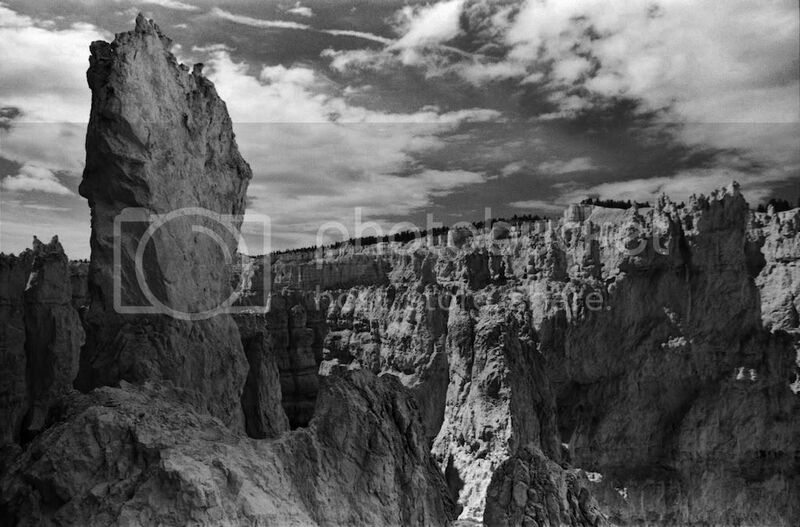 I added a poll to the sidebar of this blog. 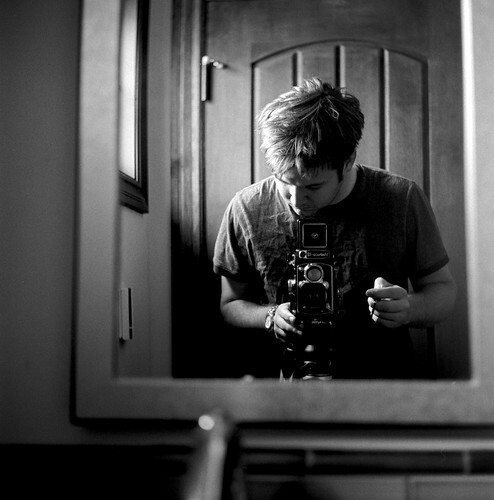 I'm curious whether you would like or dislike the occasional post on other topics like photography, wet-shaving, etc. (Not crap about the pathetic minutiae of my daily life.) I would still mostly post about tea; I'm not trying to drastically change the focus of this blog, I'm just thinking of diversifying a bit. Thanks for voting! This is a tamaryokucha, a.k.a. guricha, from the Saga prefecture of Japan. The most surprising thing? I actually like it. It was purely by accident that I bought this, as on the store shelf it was not clearly marked as a tamaryokucha. I had thought that this kind of tea, processed a bit differently than normal sencha, was just a boring inferior version of sencha; apparently I was wrong. Now, I'm not going to say that this is my new favorite Japanese green, but it was certainly good! 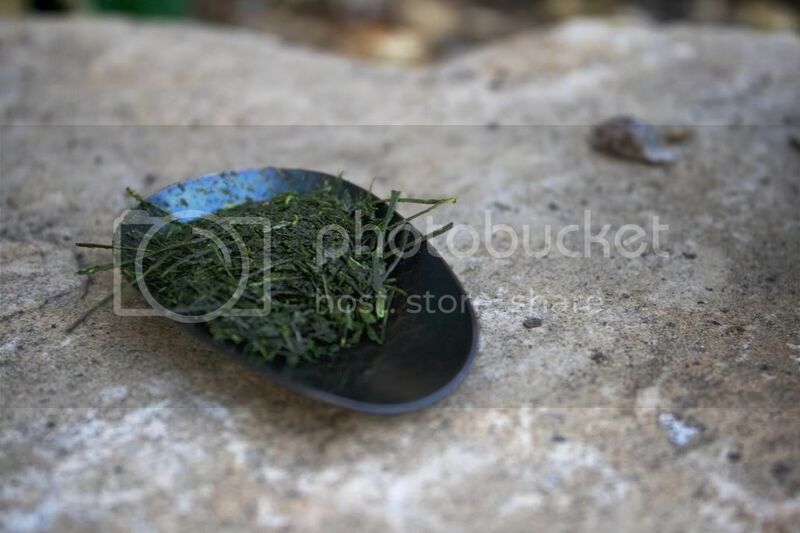 You can tell that this is a tamaryokucha by the slightly curly leaves (compared to regular sencha needles) that are not at all visible in the above photo. Trust me on this. :P Not all of them are that curly though, so I wonder if this is only a "semi" tamaryokucha. The leaf smells nice and fresh, with a cute tartness. I should have used the exposure compensation knob on my camera, as both of these are horribly overexposed. Meh, whatever, it's not like the details of the photos are that important anyway. The liquor is surprisingly green, which is only visible in the photo due to extensive and probably unethical digital color manipulation. 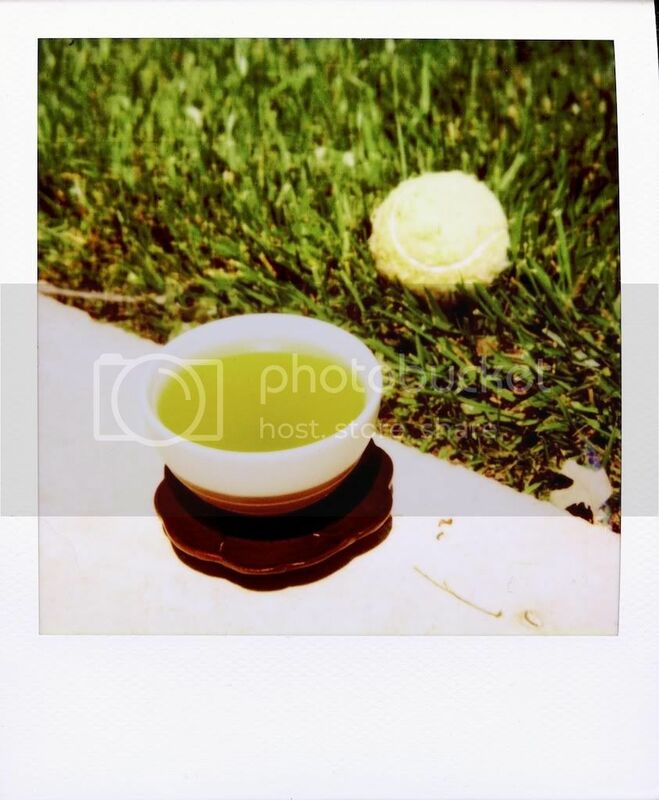 All the non-Polaroid photos I've seen of various tamaryokucha brews show a distinctly yellow-with-greenish-tinge color, while this is far closer to a green-with-yellow color. 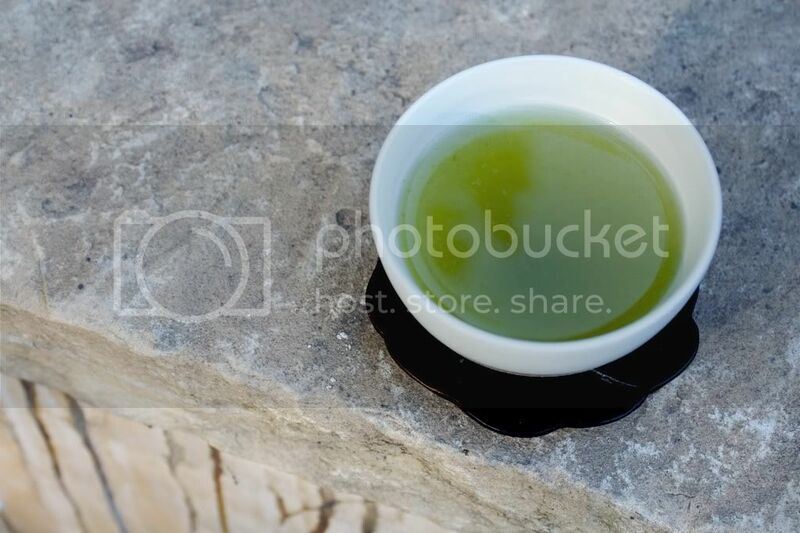 The flavor is smoother and less astringent than most sencha when brewed at around 160-165F, though it is also relatively light in flavor. It is subtly sweet, and I think it makes a good casual summer tea. I have learned two valuable lessons today. First, tamaryokucha isn't all bad. Second, Polaroids are terrible for documenting my tasting notes. Thanks for slogging through this lame post. 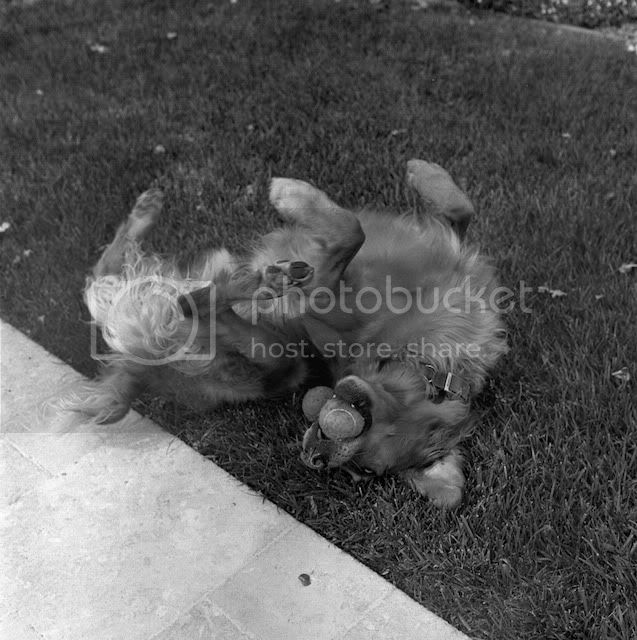 Here's a cute puppy photo for your efforts (taken with the Yashica 12 I mentioned in the previous post). 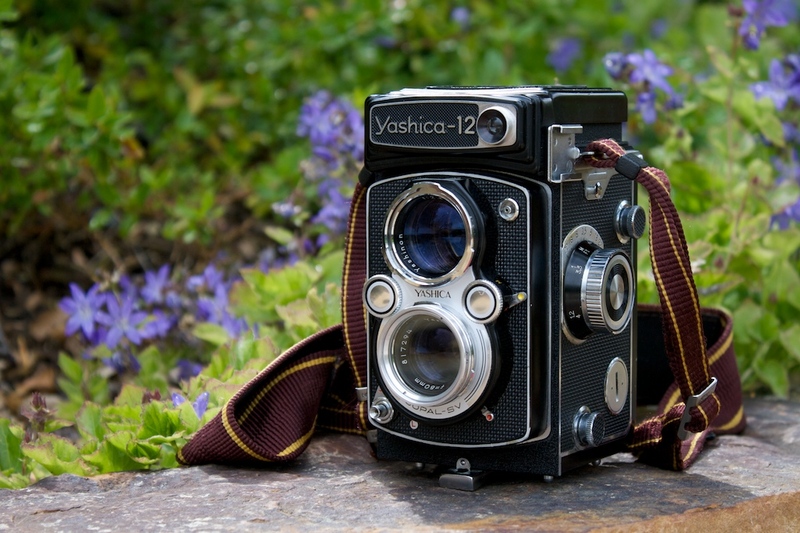 Meet my newest acquisition, a Yashica 12 TLR. I just gave it a thorough cleaning and plan on running some film through it in the next day or two; hopefully there are no major problems! The MacGyver is probably more difficult to use than The Spartan or The Lone Ranger, but it can be fun to cobble together your own teaware in lieu of a proper setup. You will need more than just a bobby pin and a match, but not much more. You will need to duplicate the following: 1) Kettle, 2) Teapot, and 3) Cup. This is even cheaper than The Spartan, and possibly The Lone Ranger, assuming you already own a couple of the items listed here. Even if you don't, they are a sound investment as you can use them for things other than tea. For the tea fanatic who just isn't happy using boring, real teaware. Need a tea fix, but don't want to run the risk that your multiple wives may meet and discover your identity while discussing your unique teawares and brewing habits? Keep the good stuff at one home, and sneak in some tea while pretending to have another hobby at the other! If you have a basic stove-top kettle and a stove, you are set. 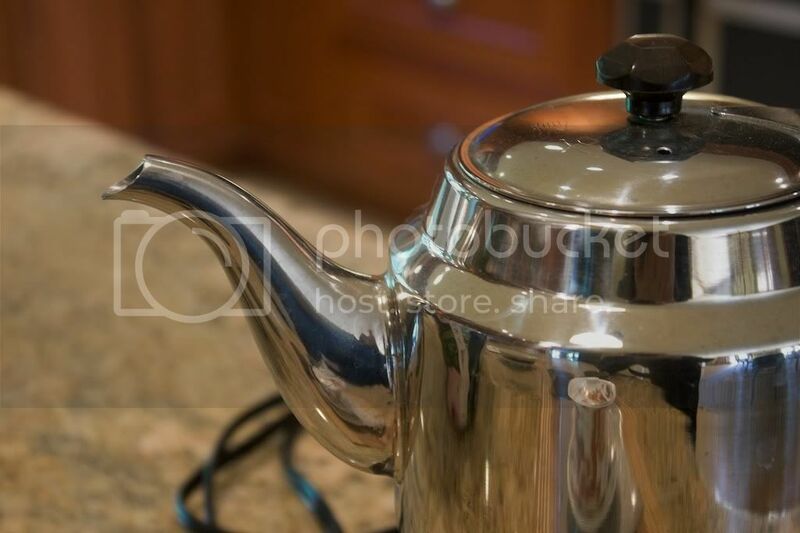 If you have a stove (or a hot plate) but not a kettle, a saucepan will do in a pinch— just be careful when pouring, as it is not exactly a precision tool. 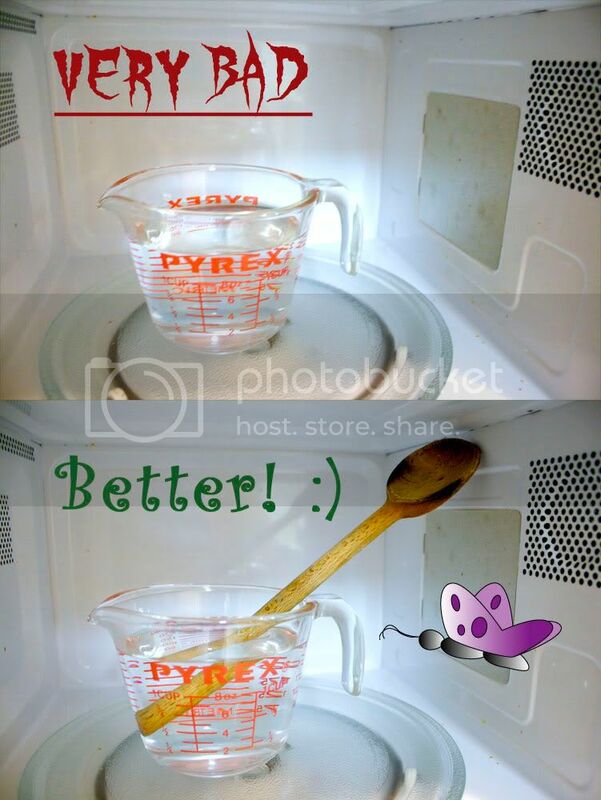 If you do not have a stove, but do have a microwave and a microwave-safe liquid measuring cup (preferably with a spout), you can use them to heat water IF YOU ARE VERY CAREFUL. If your measuring cup is too smooth, bubbles will not form even if your water is heated to its boiling point. As soon as you give it something to form bubbles on (teabag, lint, finger, anything really), it will boil instantaneously and explosively. This is a bad thing. However, this can be avoided if you place a rough wooden item like a popsicle stick or wooden skewer into the measuring cup along with your water, as these items will provide nucleation sites— places for bubbles to form as the water boils. Because of the potential hazards, and because microwaved water tastes funky, I highly recommend seeking out a kettle if possible. Please. If you can't find anything to heat water in, you can try to use hot tap water. If you're lucky, it could be as high as 135°F (Or maybe even higher, but this is the hottest I've found. I can't say I usually carry a thermometer around with me, though). You probably won't have good results if you try to steep/decant with water this cool, but you could try glass brewing with it. Dale has pointed out that this is not the best way to use a french press for tea, and instead suggests the following. "When using a coffee press you never press down the plunger, just insert it enough to hold the tea back. Pour into a cup or thermos (you might have to pull the plunger slightly if tension hold the water in) and you're done. It's clean, easy and it works great for making tea, mixing cocktails or even brewing coffee." Thanks Dale! You can read his full comment at the bottom of this page. A cup and a small plate, spoon, lid, saucer, whatever. This takes a little more finesse than the previous idea, but it's really not that bad. 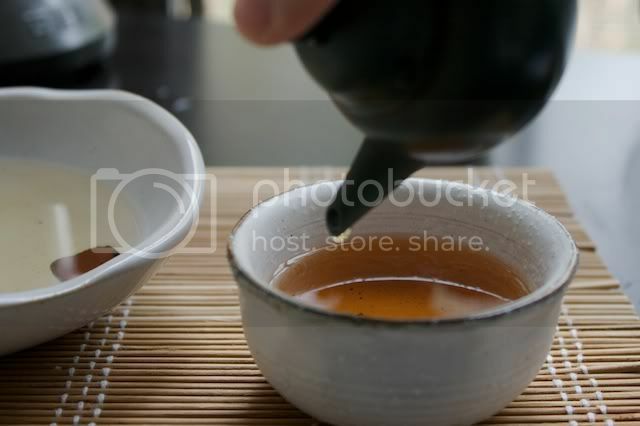 Add leaf and water to the cup, steep, then hold the other object up to the cup, leaving a small enough opening at the bottom to allow tea to pass but hold back the leaf. Try to duplicate how a gaiwan works. This is (pretty much) only feasible with whole or mostly-whole leaf teas. Pretty self-explanatory. If there isn't a mobile, solid, concave, non-toxic, non-perforated surface available, there really isn't much I can do for you. 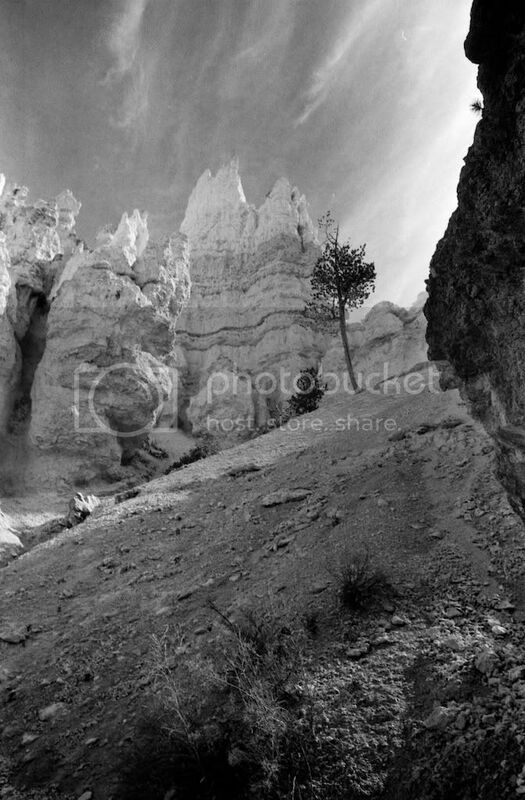 The Lone Ranger setup is as easy as it gets. All you need is a 1) Kettle, 2) Cup, and 3) Strainer (optional). No teapot required! Is still broke, but wants to be slightly less broke than with The Spartan setup. Likes making tea for one on a regular basis and doesn't want to deal with extra equipment. Friends think he/she is weird and routinely deny his/her offers of tea. Forced to make good tea in solitude. Packs light, but wants to make his/her own tea while away from home. Wants to make tea, but doesn't want to be teased by coworkers about his copious teaware collection. Probably doesn't have space for much else anyway. See here for the nitty gritty on kettles. For The Cube Monkey, if your office's water cooler has a hot water tap, you probably don't even need a kettle. Still, I would recommend getting one if you can manage it. The easiest, and probably the most appealing to The Prospective Tea-Head, is to buy an infuser cup. These things are great! You just plop your tea into the infuser, place the infuser in the cup, and steep. When done steeping, remove the strainer and rest it on the overturned lid. Try to find one with a well-perforated infuser; infusers with few/small holes don't work as quickly or allow as much water to circulate. Though the handle-less models look really cool (see photo), you will probably suffer buyer's remorse after using it a couple times. They just get too darn hot, particularly if you use boiling water. So, when buying an infuser cup, look for a handle, a lid that can be used as a plate for the infuser, and an infuser with more than a few holes. Solid design, large-ish size, and reasonably well-perforated ceramic infuser. I've heard favorable reviews about Hankook's wares, and most of these look pretty cool. This one is essentially "double-walled," so it should stay relatively cool (thanks to Victoria from TeaChat for pointing this out). It is the only handle-less infuser mug I feel comfortable recommending, though it is a little pricey. This is a more portable version of the classic infuser mug. Though infuser mugs are pretty cheap, there are even cheaper ways of accomplishing the same feat. I have written about glass brewing before (here and here), but this doesn't work for everybody. Want something almost as easy as glass brewing? Repurpose that evil infuser basket from your teapot. (If you don't already have one, just google "infuser basket" and look for something similar to the one shown here. They're only a few bucks at most places.) Just plop it in a coffee mug or cup of similar size and you're good to go. 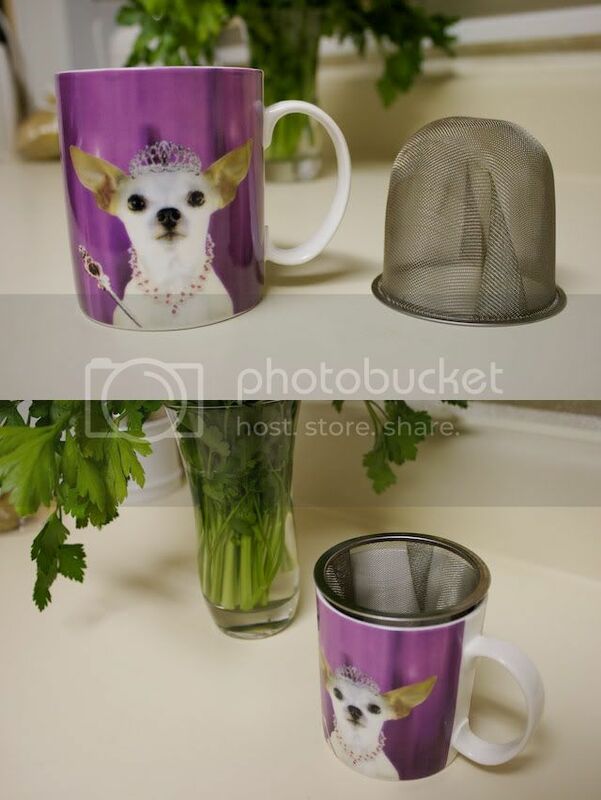 In fact, this will probably work better than a real infuser mug; mesh basket strainers drain faster and allow much more water to circulate through them than ceramic infusers. But didn't I say basket strainers were evil? Well, yes and no. Though they do not allow a large amount of leaf (say, two or three cups worth) to expand, the amount you of leaf you would use in brewing a single mug should have plenty of room. Also, if you pick a mug that is about the same size as the basket strainer, the leaves can pretty much move around the entire vessel as though there were no strainer present. Try to avoid those little tea balls. They are convenient, yes, and better than a teabag, but not by much. There is almost zero room for your leaves to expand, which is a bad thing. Besides, they really aren't that much more convenient than a basket strainer. 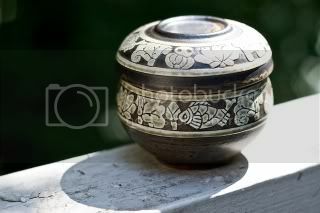 Over on TeaChat, I often see questions like "Should I get a Yixing pot?" or "What kind of kettle should I buy?" It took me a long time to finally settle down with a basic set of teawares, and I would like to share some tips I've learned along the way for those of you who may just be getting started with tea. Remember that all this is just the opinion of yours truly. You are more than encouraged to do your own research (searching the boards on TeaChat would be a good idea if you haven't done so already), but this should at least give you something to start with. "The Spartan" setup is pretty much as basic as you can get while still being able to brew almost any tea out there (Yes, you can forgo the cup if you glass-brew or use a gaiwan, but that's another post). This setup only includes three items: 1) Kettle, 2) Teapot, and 3) Cup. Some may tell you that you need fancy equipment to brew teas like puerh and dancong, but this is simply not true. Fancy equipment will probably brew those teas better, but it is not required to make good tea. 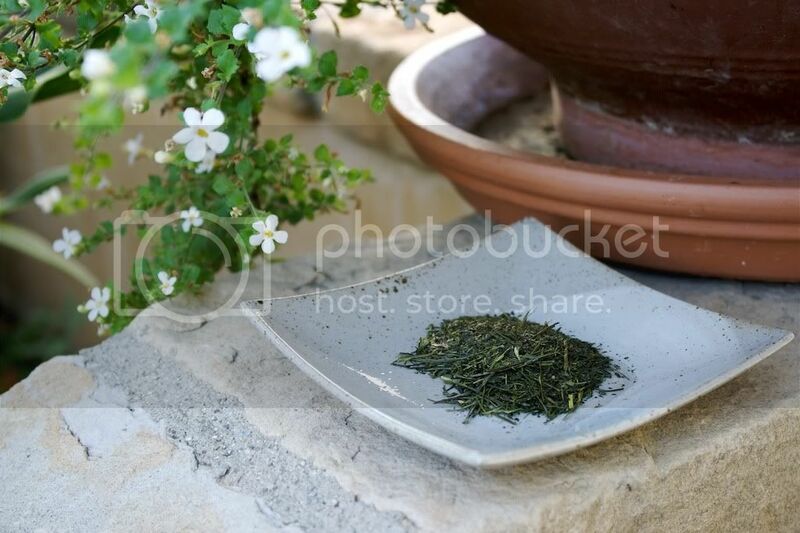 Is interested in exploring loose leaf tea, but is not ready to give up teabags. Wants equipment that can be used for both kinds of tea. Likes the idea of loose leaf tea quite a bit, whether he/she drinks teabags now or not, and wants to find out whether this is something he/she wants to pursue. The Prospective Tea-Head needs a basic setup at low cost that can be built upon later. Kettles should only be used to heat water (unless you're making Tibetan tea, but nobody in their right mind would)! You do not brew tea in a kettle; you heat water in a kettle and brew it in a teapot. In case you are wondering, yes, you need a kettle. I know, I know, you could microwave water in a cup and dunk your tea leaves in it, but if you want to do tea the right way, get yourself a kettle. Trust me, it's worth it. There is a plethora of options when it comes to kettles, so no one blames you if you are confused about which one is right for you. There's always the the low-tech stove-top design, or you could splurge for a fancy electric induction kettle if you desire. You could also drop a bunch of cash on something ceramic, iron, silver, etc., but if you belong to one of the groups mentioned above, it will probably be more trouble than it is worth. For the sake of this article, let's focus on stove-top and electric models. They are cheap and plentiful, and you can often find one in an aesthetically-pleasing color or design. Unfortunately, they will more or less confine you to your kitchen unless you have an electric hot-plate, which makes little sense as electric kettles are so cheap. 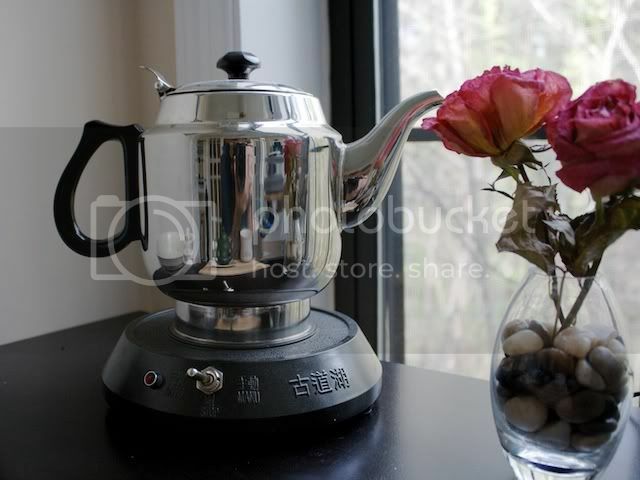 Cast iron kettles (NOT those enameled tetsubin teapots you find in the US) will keep your water hot for longer than aluminum or steel models, though they also take longer to heat. Just head over to Target or Walmart. They really aren't all that different functionally, so pick out something pretty. My favorite. All they require is a plug, so you can easily set one up in a home office or your cubicle at work, if your boss allows it. They tend to be very fast, shut off automatically once boiling, and some come with handy features like temperature control and a re-boil mode. Many of them are made out of plastic, but there are steel options if that concerns you. Cordless models allow the kettle to be lifted off the plugged-in base plate, giving you more range of motion. As for the mechanics, there are two types of electric kettles: induction and conduction. Hobbes recently wrote a great article about how induction kettles work, if you are interested. Induction kettles are very fast, but their circuitry needs to be cooled by a fan, so they can be noisy. Conduction kettles are much simpler, as they are just heated by a resistance coil which converts electricity into thermal energy. They are slower to boil than induction kettles but are still relatively quick, and they do not need noisy fans. They are also quite a bit cheaper, which is a big plus. Note that conduction kettles are rarely advertised as such, but if it doesn't say "induction", it's a conduction kettle. A quick note about electric kettles with the variable-temperature feature: they are rarely accurate. I won't say "don't bother," as some people still like them, but be aware that if you are trying to hit a more exact temperature, a fixed-temp kettle and a standard meat thermometer will do a much better job. A well-built, variable temperature kettle. Again, don't expect much precision from the temperature dial. Adagio's electric kettle. More expensive than the Upton model, but better looking (and probably higher-quality, but I do not know from personal experience). These are not always of the highest quality but they work well enough, have a nice pour, and have a re-boil feature. For what it's worth, I love my Kamjove. I believe the induction model also has a variable-temperature setting, but I'm not 100% sure. Simplicity is the key when it comes to picking out a good basic teapot. Buy something simple, small-ish, functional, and with as few moving parts as possible. Smaller is usually better. Not only will it make you learn to re-use leaves (a good habit to learn if you are a Prospective Tea-Head), but you will go through less leaf (good for the Starving Artist/Student), and your tea will still be hot from the first cup to the last (good for everyone; re-heated tea is not very good). When brewing tea Western-style, which you are probably doing if you are reading this, a good rule of thumb is 8-16oz per person. E.g. If you just brew tea for yourself, a one- or two-cup teapot is a good size; for two people, try a three- or four-cup teapot, etc. If you usually drink tea by yourself but occasionally brew for others, just get a somewhat larger teapot and not fill it as much when brewing for yourself. Choose something made of porcelain, glazed clay, enameled cast-iron (shown here), or glass. Glass isn't nearly as good at retaining heat, so unless you really like watching tea leaves unfold, or plan to make mostly green and white teas, I'd avoid it. Also avoid un-glazed clay teapots. They are great if you don't mind dedicating them to certain types of teas, but strong flavors (particularly Shu puerh, Lapsang Souchong, Earl Grey, and other artificially flavored teas) can stick around and ruin your more delicate brews. These are hotly debated. They are convenient, yes, but most strainers (particularly those evil little basket strainers) do not allow tea leaves to expand enough. This may not bother the Casual Brewer, but if you really care about the quality of your tea, just dump the leaves right into the pot and pour the brewed tea through your strainer to keep leaves out of your cup. Another kind of strainer, often found on teapots made by Bodum, is a little like a french press. By depressing the plunger, you squeeze the leaf into the bottom of the strainer where there are no holes, which basically stops the infusion. This works okay, but it isn't perfect. If you leave it sitting there long enough, it will continue to infuse (slowly) and will eventually over-steep your tea. I'm also not wild about squeezing tea leaves like that; not only does it force out some nasty flavors, but I can't imagine it makes subsequent infusions any better. 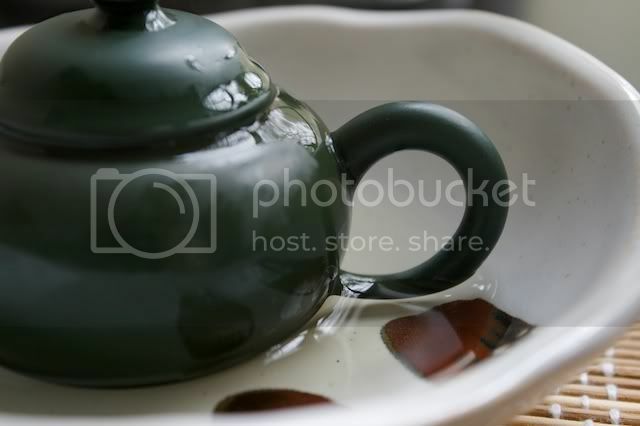 Some teapots, typically Japanese ones, have strainers built into the teapot. This allows leaves to expand and prevents them from escaping, but it can make cleaning more difficult. Still, I think it is the best option if you really want a strainer. I have no personal experience with this one, but it would be first on my list if I were in the market for a new basic teapot. Originally, cast iron tetsubin were used as kettles by the Japanese, but almost all American imports are enameled and cannot be used to heat water. The enameled versions make pretty good teapots though. You're on your own. Cups are the easiest— just make sure that you can decant the entire volume of your teapot into your cup(s), so you avoid over-steeping any tea left in the pot. If you insist on using one of those diabolical removable strainers, you don't even have to worry about this— but you aren't going to use those, are you? Didn't think so. Just find cups you like. It could be handle-less, like the one pictured here, or not. Actually, I'd probably recommend getting something with a handle if you are brewing large amounts. It's just more comfortable. Alternatively, you could check out those double-walled glass cups made by Bodum; they stay cool to the touch and look pretty awesome. They are fragile though, so be careful when washing them. I hope this helps answer some of your questions about what kind of teaware to start out with. If there's anything I missed, or if you have a more specific question, please ask! I feel like a broken record saying this, but thanks go to Adrian for this sample (he sent me so damn many!). At 78¢/gram, this is definitely one of the most expensive teas I have had the pleasure of trying. Not surprisingly, it is a very good tea, especially for one so new. The dry leaf's aroma is gorgeous: chocolate, caramel, cassia, and maybe some nutmeg. The best part though was its richness. Really, wow. When wet, the leaves give off charcoal and fruit notes, a pretty typical scent for a young Wuyi. The first infusion is best characterized as "lively." It is rich, fruity (think tropical fruit, like kiwi), floral, and thick in the mouth. The second infusion has a hint of charcoal but is mostly the same as before. By the third infusion there is a nice oiliness developing on my lips, and a relaxing cha qi feeling. 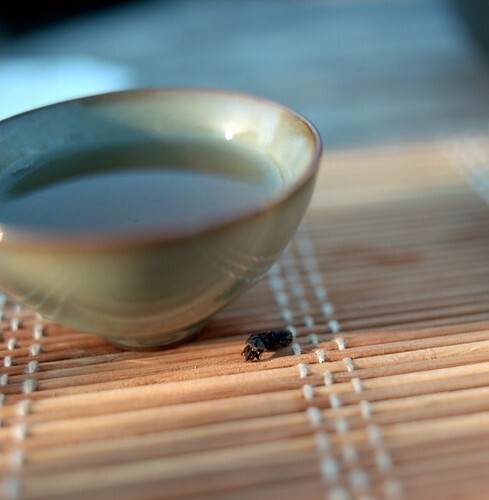 In the next few infusions the fruity/floral liveliness is replaced by spice and the classic yancha texture. All of the infusions are a vibrant orange color— very purty. There probably would have been some more charcoal if I brewed it stronger, but whatever. This was a very impressive yancha, though it definitely does not taste like a heavily roasted one if that is what you are looking for. 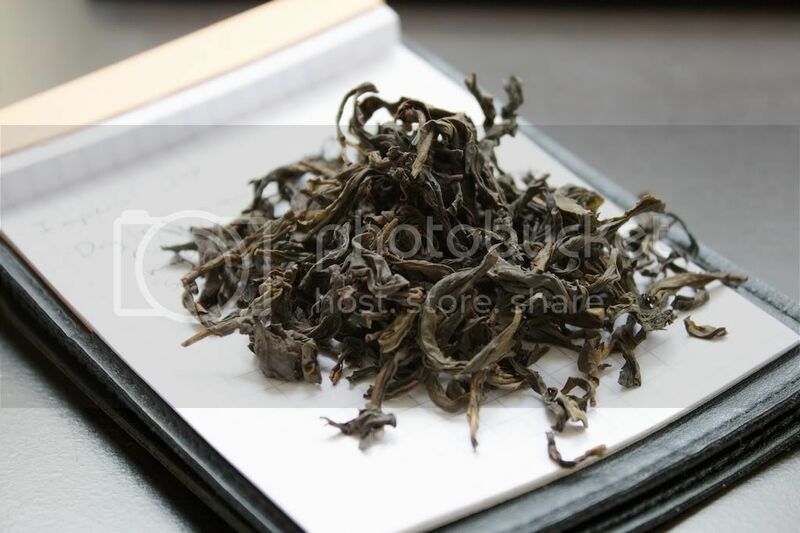 As Jing Tea Shop says, this tea is ready to drink now and really doesn't need any aging. I don't pretend to be an expert on aging oolongs, but I don't get the feeling that this one would age well. Even more reason to drink it now! Yum! 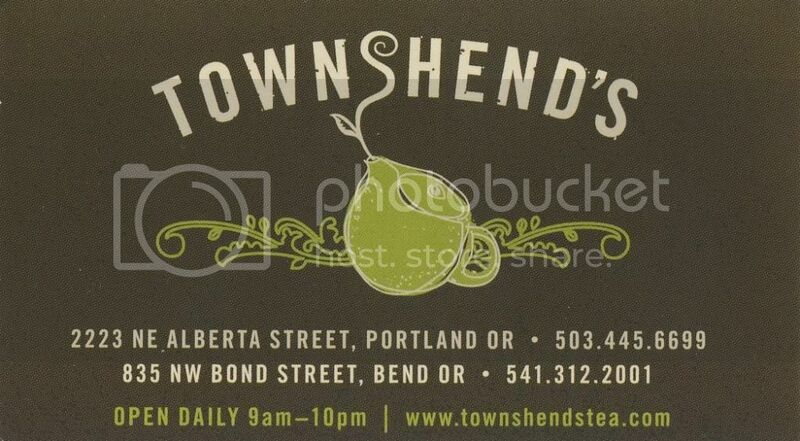 While in Portland several days ago, a certain family member brought me to this little tea place on Alberta Street called Townshend's. I don't usually expect much from these sorts of shops, but I was pleasantly surprised. It is a contemporary tea house, as opposed to the stereotypical dusty/overstuffed Chinese tea shops and doilies-and-pinkies Victorian tea rooms. I thought it worked well; it's the same sort of design that Starbucks had their way with, but I don't mind. It was peaceful (it seemed to be a nice spot for studying or reading, for those of you who go places to do either), comfortable, and the staff was friendly. Oh yes, and the tea isn't bad either. From what one of the employees told me, the place used to be focused on chai and bubble tea, but they have recently developed a pretty decent loose leaf tea list. Don't get too excited-- I doubt there is anything there that you couldn't find online for a better price, and there isn't a ton of variety (I don't remember if they have any puerh actually, probably just some cheap shu), but their selection was very good for a small brick-and-mortar store. We ordered a Tie Guan Yin and a Wuyi yancha (probably a Shui Xian), which were served in gaiwans (large ones-- probably 7 oz) with cups to decant into. Also provided was a reasonably-sized kettle over a tea candle. It is hard to see in the photo, but they actually gave us a lot of leaf! The little tea light didn't keep the water very hot, but I imagine that is one of the more difficult challenges in serving tea to customers. Even Imperial Tea Court (the Ferry Building location, anyway) doesn't take any measures to keep your water warm, though I'm sure they would reheat it for you if you asked. The employee I was talking about earlier (Sadly, I forgot his name) came over to talk and we chatted for a bit about the teas we like and what vendors we buy from. I was happy to find someone really interested in tea working at this place. I've heard the horror stories about Teavana employees and assumed the worst, but this store seems to employ people that are genuinely interested and pursue tea as a hobby on their own time. Overall, I had a great time, and this place exceeded my expectations. Check it out if you are in the area. This tea was a gift from Adrian, purchased at Serenity Art in Portland, OR (I wish they had an online store! Arrrgg). 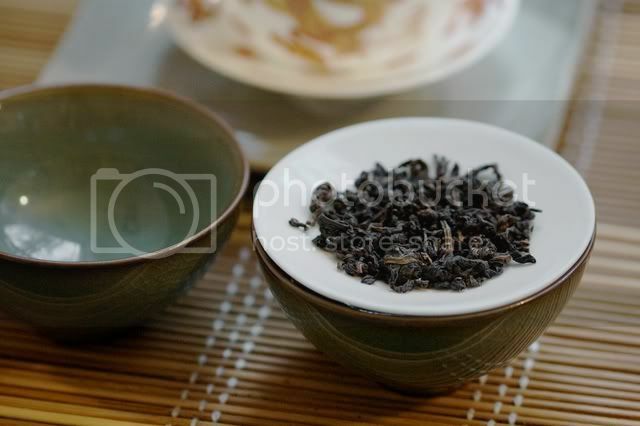 It is a somewhat-heavily roasted gaoshan, which is not always easy to find-- the unroasted, nearly green oolongs are reported to be more popular with young tea drinkers in China and Taiwan. If you like Just4Tea's roasted TGY, you will probably like this tea too. The dry leaf smells of cocoa, caramel, and toasted grains. It looks darker than Just4Tea's roasted TGY, so I'm guessing this was roasted more. The liquor has a solid caramel/ toasted grain flavor. It is sweet, smooth, slightly fruity (blueberry, I think), and it has a little bit of a kick from the roast. This is a very good roasted gaoshan, and I would definitely recommend trying it if you happen to find yourself in Portland. Coincidentally (and conveniently, for this post), I was in Portland this past weekend and stopped by the store. It is a nice tea shop with a large selection of teas and teawares, which are generally cheaper than products of similar quality you may find online. Communication can be an issue (particularly if you butcher Chinese tea terms as badly as I do), but the owner is helpful and patient. On a mostly unrelated note, I just got a new (used) lens: a 28mm f/2.8 Nikkor Ai. So far it seems to work fine; I used it for all the tea photos in this post (Not that they are anything special. Actually they're pretty lame, but the lens works fine). 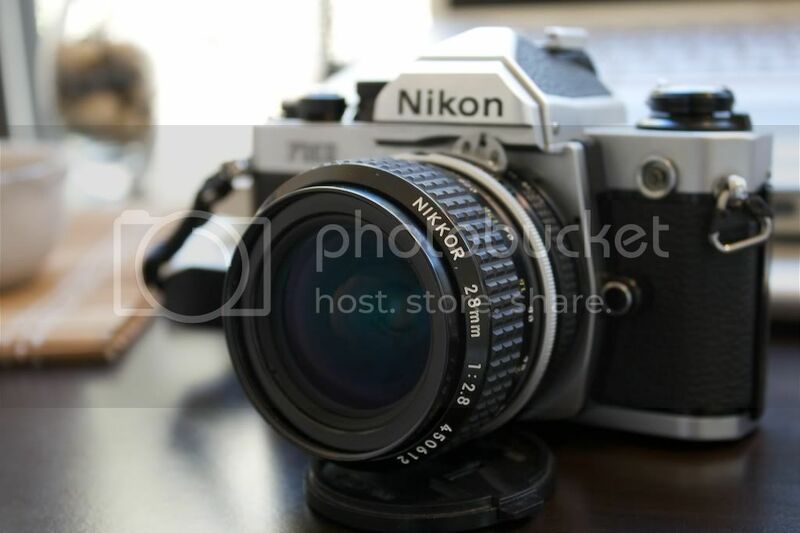 It is a manual focus lens though, so it can be hard to focus properly on my dSLR (the viewfinder is much smaller and doesn't have a split-prism for determining correct focus, unlike my film SLR), especially handheld in low-ish light like I had. Also, on my crop-sensor dSLR it is only the equivalent of a ~45mm lens, which is why these shots don't look like they were made with a wide-angle. I'm looking forward to running some film behind it though! A big thank you goes out to Victoria from TeaChat, who generously sent me a sample of this very fine (and very pricey) tea. I stupidly brewed this tea while focusing on something else the first time; I am glad I gave it the attention it deserves when I revisited it. 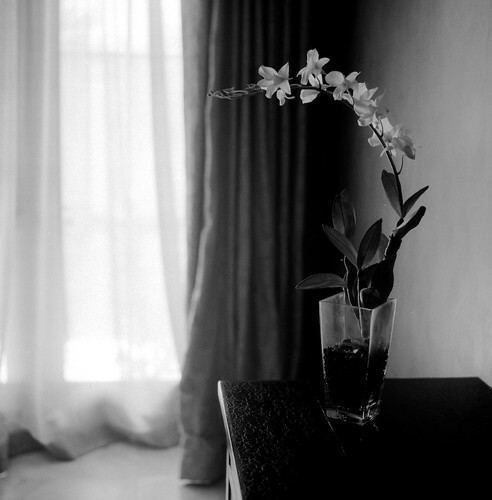 "Da Wu Ye" translates to "Big Dark Leaf" and "Jiang Hua Xiang" translates to "Ginger Flower Fragrance." Everything about this tea is subtle, which may or may not be a good thing. The dry leaf's aroma is almost undetectable. The flavor is mild, especially compared to the 90's Golden Pearls Dancong I recently tried. It is certainly not a powerhouse in any sense. However, it is a rewarding tea if one is in the mood for a subtle, delicate experience. This tasting session was one where all the pieces clicked into place. Forgive my waxing poetic, but the soft winter light was a perfect visual complement to this tea. It is lightly honey-sweet, with a clear but fragile ginger flavor and a sweet aftertaste. Gentle brewing seems to help with this tea; I used a relatively small amount of leaf (about 1/2 full, which really isn't that much with long dancong leaves) and shorter brewing times (5, 10, 20, 30, etc.) than I normally would. 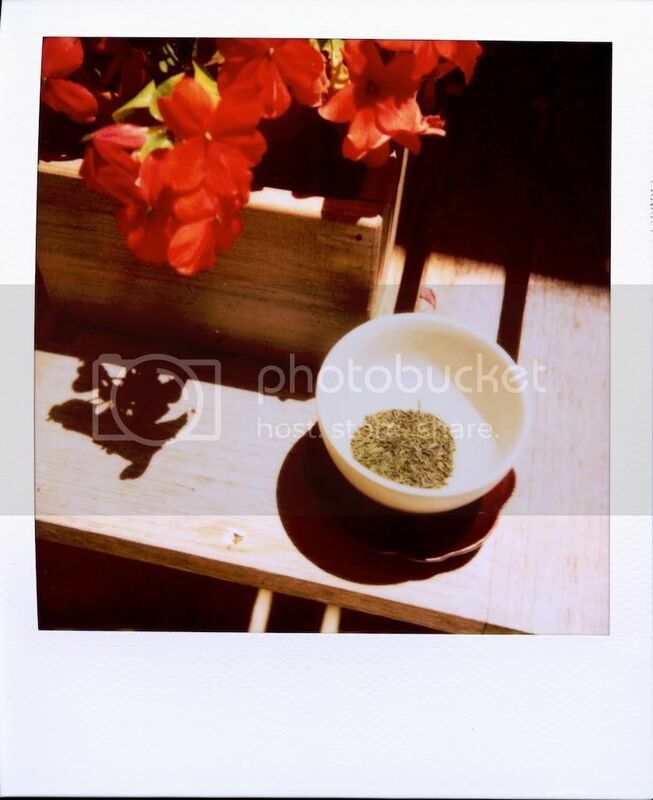 In addition to its wonderfully delicate flavor and sweet aftertaste, I felt warm and relaxed after drinking this tea. I couldn't tell you whether it was solely due to the tea or other factors, but the tea certainly didn't hurt. This really is one of the finer teas I have ever had. It is not the most complex or the most powerful tea, but it does not waver in its subtlety or clarity of flavor. * As usual, Tea Habitat does not disappoint! *Ugh, that sounds so corny! It is the best way I can think to describe it though, even if the purple prose does make me want to barf. For whatever reason, I always seem to forget about dancong. I don't know why, as good dancong can be absolutely amazing, but I never think about it when shopping for tea. Thanks are due to Adrian for this sample— I probably would have passed over this tea, and I'm very glad I didn't. Plus, this is an odd dancong as it is rolled into balls instead of twisted, and I love trying weird teas. It is also aged. Mmmm. 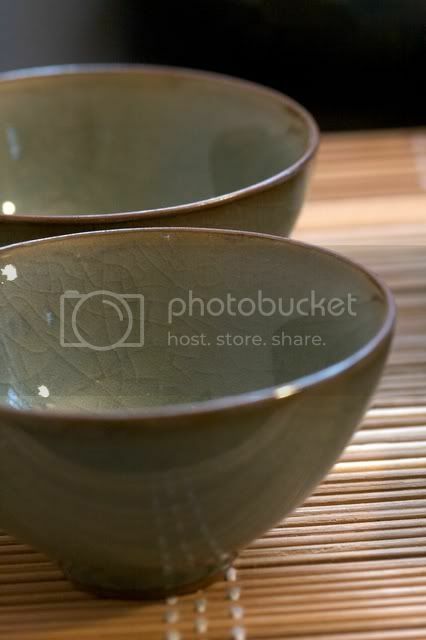 One of my Christmas presents: two crackle-glaze celadon cups from Dragon Tea House. Thanks Mom! The opening-of-the-bag experience was, sadly, disappointing. I guess I'm just spoiled by Imen's fantastic dancongs, as now I expect dancong aroma to fill the entire room when released from its mylar prison. However, this tea smells absolutely fantastic after a quick rinse in boiling water. I kid you not, it smelled just like blueberry-lemon muffins. Mmmmmmm. Even the first infusion has solid flavor, which is pretty uncommon for dancong. Different temperatures seem to bring out different flavors, which was pretty fun. Slightly cooler water brings out blueberry-lemon muffin, while boiling water makes it taste more like grapefruit (I guess the extra heat pulls out some sourness, which really isn't bad here). Whatever temperature you use, you will be rewarded by bright, fanciful flavors and a solid aftertaste. The texture is a bit thin and there I found little to no oiliness, but the flavor and aroma make up for these shortcomings. You have no idea how difficult it is to arrange things like this in a straight line. Who knew? This is a fantastic tea. It is pretty expensive at $24.50 for 2 oz, but compared to other dancong, that's not such a bad price.